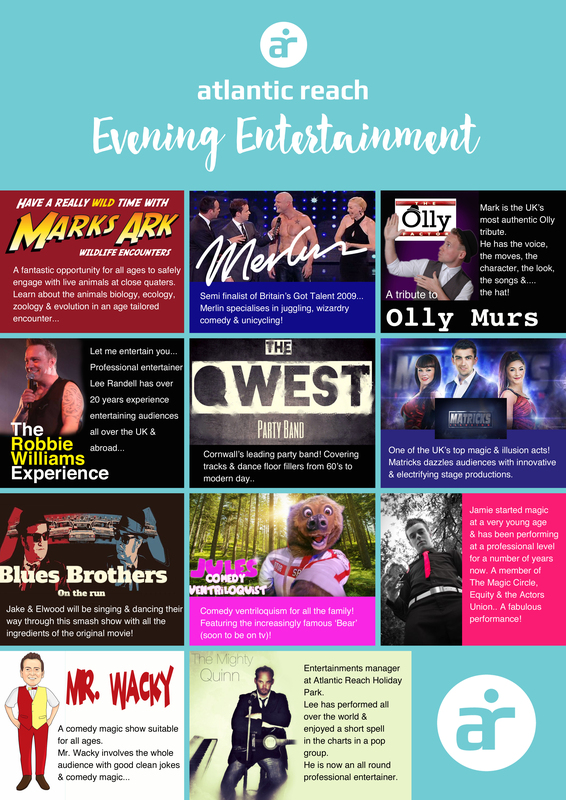 Theatre-style shows, some of the country’s top cabaret acts, be wowed by the ultra-talented entertainment team who set the stage alight every week with live shows. Little ones can dance the night away with Pirate Pete himself at the Pirate Pete’s welcome party. Every night it’s show time, with top cabaret acts, bingo and prizes galore. Check out the Entertainment Acts here. There are play parks, safe and fun. Little ones can run riot in Pirate Pete’s soft play area or splash in the swimming pools. We get great feedback about our staff and entertainers. It is easy to book, so why not check the schedules and join in! From a Britain’s Got Talent finalist to a top magic and illusion act, all entertainment is exclusive to our holiday guests with an Atlantic Reach Leisure Pass. This is guaranteed for all bookings made direct with us or through Hoseasons. Please enquire prior to arrival if you have any queries regarding your booking and what is included. We look forward to hearing from you soon! Live acts, games, magic shows, and much much more - whatever your age there is something for the whole family to enjoy at Atlantic Reach! We know that happy children means happy parents, so every night from 6:30pm during school holidays*, we have a jam-packed entertainment programme to keep them smiling! Travelling with toddlers? We have a range of activities like bubble and balloon parties, animal encounters and bouncy castle fun. Drop in at reception or keep an eye on our notice boards outside the Café and the Manor Arms for what’s on when you’re here. *Excluding February Half Term & Christmas Holidays. Kick back and relax while they let loose! Right in the main leisure complex, Pirate Pete’s soft play area is fun and safe for up to 8’s, with soft play zone, big lego, toys and games and plenty of books. There’s a baby food warming station and we offer table service from the Café, bringing delicious Origin coffee, homemade cakes, food and healthy kids lunchbox meals straight to you. Warm in the winter and air conditioned in the summer, it’s wholesome family fun all year round! Open 8am-8pm Monday-Saturday and 8am-5pm Sunday. Prices; free for those staying with us and children aged under 9 months, £2 per child aged 9-18months, £3 per child aged over 18 months. Please note, if you wish to use Pirate Pete’s you must have either a Membership Card, a Leisure Pass or a Local’s Card. With two pools, a soft play area, outdoor playground, arcade, tennis courts, golf course and 30-acres of grounds to run around in, we guarantee there’s fun to be had onsite all year round, no matter the weather! Remember to check the notice boards when you arrive to see what special activities are on whilst you’re here. If you fancy venturing offsite, surfing, paddle boarding, zorbing and some of Cornwall’s best family attractions are all just a stone’s throw away. Ask a member of our friendly team when you arrive for the best local recommendations. We’re here to do the hard work whilst you sit back and watch your little one making magical birthday memories with their friends. With lots of options including soft play, swimming, Madness & Mayhem & Sport themes, there is something for all ages! Buffet options and party bag goodies can be arranged, and you’ll have a dedicated party host on the day to make sure everything goes smoothly. Check out our party planner below. For all enquiries, please email us on functions@atlanticreach.co.uk or give us a call on 01726 862010. Make a splash no matter the weather! Our indoor pool is toasty and warm (31°C) with main swimming area and baby pool. The outdoor pool is perfect for a dip on warm summer days. Both pools host a variety of activities from fun sessions with inflatables to swimming lanes and Aqua Aerobics - check what’s on with the team when you arrive so you can join in the fun! The indoor pool is open 6.30am-8.45pm Monday-Friday, 7am-8.45pm Saturday and 7am-4.45pm Sunday. The outdoor pool is open during the summer months. Please note, if you wish to use the swimming pools you must have either a Membership Card, a Leisure Pass or a Local’s Card. Swing into action! Fun for all the family and just a two minute walk from reception, our 9 hole, par 3 course has holes ranging in length from 92 to 152 yards - great for players of all ages and abilities! Serious golfer? Some of the country’s best golf courses like Rock, Trevose and Newquay are just a short drive away. Football golf follows the golf course route with dedicated holes. Two tennis courts and football nets are also set up in the summer months. Clubs, rackets and golf balls are all available from leisure reception. Atlantic Reach is home to one of the largest and best equipped leisure facilities in Cornwall. With 80+ classes per week, over 300m2 of gym floor space, two fitness studios, a dedicated spin studio (complete with disco ball and lights! ), a virtual studio plus the best instructors from around Cornwall, stay fit while you stay with us! Open to guests with an Atlantic Reach Leisure pass, members and visitors all year round. Click here to take a look at our best deals right now! Or click here to learn more about our Local’s Cards.